For the purpose of a perfect use of the fuel energy and in order to ensure that the harmful exhaust gas emission does not exceed a minimum level, it is necessary to optimize the spark plug construction with regard to the requirements of particular engines. change in the electrode gap in course of the spark plug replacement interval. 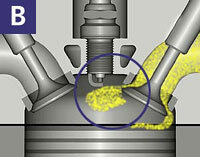 Different engines require different spark plug arrangement and its location in the combustion chamber. In order to achieve longer lifetimes of spark plugs required by the engine producers, there are used multiple spark plugs and precious materials (such as platinum, silver, tungsten). By means of shifting the insulator tip suitably out, i.e. 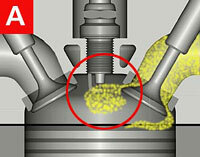 into the combustion chamber of the engine, better access and ignition of air fuel mixture is achieved.